This is a glass jewelry cabinet made of wood. The display area increases the visibility of your products due to its black velvet covering. The storage are that is built into this jewelry cabinet has one shelf. This is a great area to store important information and/or items in. The rear glass sliding doors to this cabinet have a locking mechanism. This prevents any theft. Lights are available for this jewelry cabinet as an option if you want to ensure maximum visibility. The lights ensure that no matter the ambient lighting condition your products will be visible. 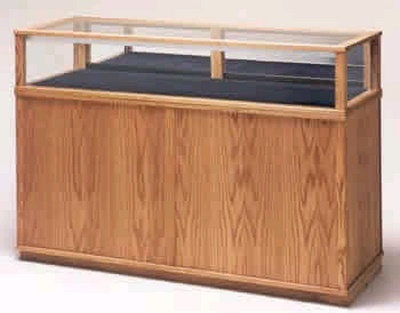 We also build custom wood glass jewlry cabinets if this design does not fit your requirements exactly. Click here to view the full line of custom finishes we have available for this glass jewelry cabinet.